During his recent trip to the region, Secretary of State Colin Powell told Syrian President Bashar al-Asad that the road map will first address the situation between Israel and the Palestinians, and later will turn to Israel’s issues with Syria (and Lebanon). However, the issues between Israel and the Palestinians and between Israel and Syria cannot be resolved in isolation - the two tracks are interconnected and must be pursued concurrently. The overarching core issue is the violence that has plagued Israel and the Palestinian areas for the last 31 months. That circle of violence not only affects the Israeli-Palestinian track, but the Syrian-Israeli track as well. The Palestinians blame the Israeli occupation forces for the violence, claiming the right of self-defense in their actions against Israeli troops. However, their actions also extend to the use of suicide bombers against civilian targets in Israel proper. The groups that have executed these attacks are Hamas*, Islamic Jihad, and the Al-Aqsa Brigades associated with Yasir ‘Arafat’s Fatah** movement. Israel accuses Syria of supporting – or allowing Iran to support – the Palestinian groups, groups the United States has labeled as terrorist organizations. Syria, while supporting the U.S. global war on terrorism, does not recognize these Palestinian organizations as terrorist organizations, but rather as liberation movements. Israel also accuses Syria of supporting the Lebanese group Hizballah, considered by the United States as a terrorist organization, but again considered by Syria as a liberation movement. Hizballah fighters continue to conduct attacks on Israeli forces occupying a contested area in the tri-border area of Syria, Lebanon and Israel, and area referred to as the Shaba’a Farms. *** Israel believes that Damascus uses Hizballah as a surrogate guerrilla force, allowing it to conduct operations against Israeli troops while maintaining plausible deniability for responsibility. As part of any settlement, Israel will demand that Syria stop its support of these groups. 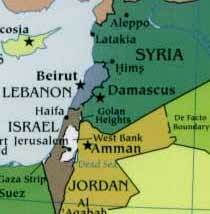 In return, it almost certainly will return the Golan Heights, which it has occupied since 1967, to Syria. There are sensitive water and border issues, but these can be resolved. Syria will consider withdrawing the bulk of its forces from Lebanon, but stopping support to Hizballah and the Palestinian groups will be the key Israeli demand. *** While most international bodies recognize the border placing the Shaba’a farms in Syrian territory occupied by Israel, both Lebanon and Syria now claim that the area is part of Lebanon, giving Hizballah a reason to continue attacks on Israeli forces. Israel withdrew its forces from southern Lebanon in 2000 and was certified as having met the requirements of United Nations Security Council Resolution 425.